"Foreign chemical agent found on British soil." A headline that resonates with many of us after the recent events in Salisbury. It is often said that fact is stranger than fiction. Not in this case however, for it was two years ago that I sat down to write my third book, Drugs To Forget. I promise you I am no clairvoyant, but the plot involves the planting of a chemical agent in southern England by a foreign terrorist group. They are Africans rather than alleged Russians, and the agent is Ebola rather than a nerve substance, but the story sounds oddly familiar. I used to ply my trade as a documentary film producer, and my tale began to germinate with an event in Africa. My crew and I were en route from Harare to the African bush, planning to film a television programme on healthcare in the developing world, and were brought up sharp by a wail of sirens. Red dust was kicked up in the distance, flashing blue lights tore towards us. The cameraman, who was driving, spat out an expletive, wrenched the truck onto the verge and pulled up with screeching brakes. Later I was told that this is not an unusual occurrence in Zimbabwe. This was some years ago, but I assume the new president may have the same rules. Motorists must pull over immediately when the presidential cavalcade is passing. "What happens if you don't stop?" I asked. "They shoot you," the cameraman replied. Later that year, we travelled to Surabaya in East Java for the same programme. It was hot and clammy, and we slept in the villagers' huts. The terrain was difficult and electricity hard to come by, so you would think filming would be challenging. But the people of Indonesia made it all possible. A whole town stopped cooking so that we could draw enough power to switch on our lamps, men worked overnight to construct some gear we needed, and a few hundred people turned up as unpaid extras to fill a busy market scene. Imagine that happening in London - I don't think so. My filming exploits, among them these scenes in Africa and Indonesia, have offered ideal fodder for my books. All I have to do is to sprinkle in some extra crime. The final ingredient for Drugs To Forget was plucked from my medical films. One of them involved pharmaceutical drug trials. We showed how drugs were made and sold, in a world involving so much money that it could be easy to cross the line. Ebola is a terrible disease, and the threat of spreading it, for no matter what cause, a terrible thing. Fortunately my protagonist, investigative filmmaker Nathalie Thompson, is on the case. 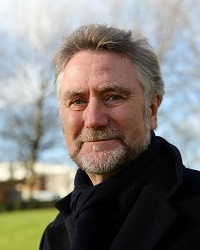 While Natalie and her counterparts continue to brave difficult situations to get their films in the can, I have taken a step back from the industry after 30 years to pursue another occupation. I've done my stint, and writing thrillers is far less dangerous. 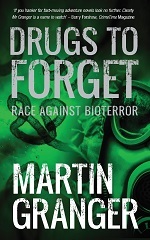 Martin Granger's Drugs To Forget is out from RedDoor.